Reactions is a new photo sharing app for iOS currently going through Apple's approval process. You hold up your phone, snap a picture and share it to Facebook. Nothing out of the ordinary, nothing of significance. Except, Reactions puts a unique spin on the process, simultaneously snapping a picture with both the front and rear camera. What's also notable about the app is that it was developed by legendary hacker George Hotz (AKA geohot), who is best known for his work with the iPhone and Playstation 3. Hotz says the purpose of Reactions is to tell the full 2000 word story of a photograph. It definitely puts an interesting spin on photography, but it seems like the front-facing cam will just capture awkward Myspace photos. The point of being able to share photos—through Instagram, for example—is to share a moment, a subject and what you're seeing in front of you. Not necessarily how you look. But the app's name is certainly fitting. I could see this being particularly useful at a sporting event , or maybe on a roller coaster. 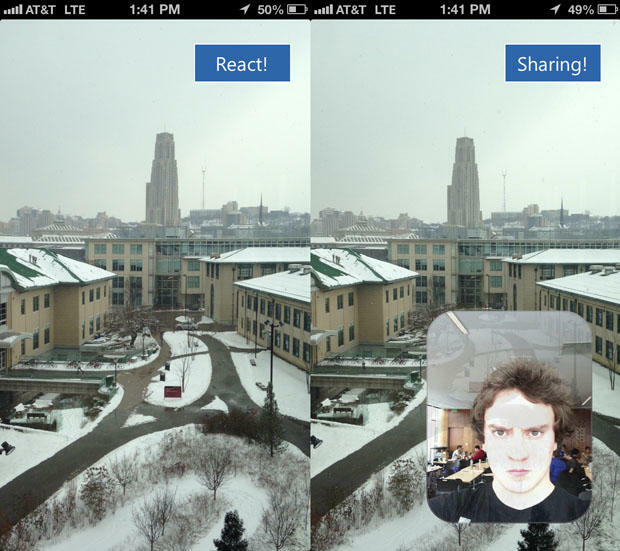 Reactions is targeted at capturing that, "I have to share this now" moment. It doesn't save your pictures unless you share them, which is interesting. (Be careful what you capture!) "After a reaction is captured, you have 3 seconds to hit the unlabeled cancel button, or else your photo is automatically shared with all your Facebook friends," Reactions' website explains. Off the cuff, unapologetic and different, just like Hotz himself. Look out for this one soon.